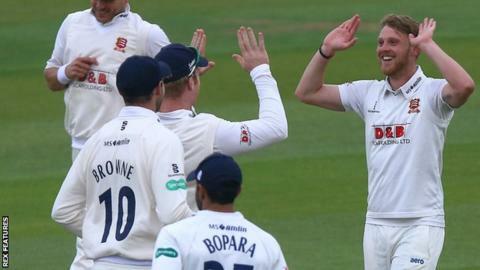 Hampshire lost five wickets with the score on 18 before closing on 92-7 as Essex took charge on day two of their Division One game at Chelmsford. The hosts resumed 243-2 but, after losing Alastair Cook for 124, subsided to 360 all out as South African paceman Kyle Abbott finished with 5-58. But Hampshire collapsed from 18-0 to 18-5 in the space of 17 balls and were in deeper trouble on 34-7. Lewis McManus and Abbott saw Hampshire to the close without further loss. Seamer Jamie Porter began the collapse when he had Liam Dawson caught behind before bowling captain James Vince middle stump at the end of the same over. Matthew Quinn trapped Michael Carberry leg before offering no shot and had Rilee Rossouw caught at mid-on off successive balls in the following over, before George Bailey shouldered arms to a Porter delivery that nipped back off the seam. Ravi Bopara then removed Sean Ervine and Gareth Berg in the space of five balls, before wicketkeeper McManus and Abbott steadied things for Hampshire, who still trail by 268 runs. Earlier, Abbott had bowled Hampshire, who will be without Fidel Edwards for the rest of the game with a shoulder injury, back into the contest with his third five-wicket haul of the season, including having England opener Cook caught behind having added 10 to his overnight score. "Abbott bowled beautifully and showed what a skilful bowler he is. We know he's a good bowler and showed us why. "He bowled beautiful lengths, beautiful lines and made life very difficult for us. He's an international-standard bowler and that's what they do. "But then Porter and Quinn, in their opening spell, showed they had taken note of how Abbott bowled on the wicket and put it into practice and got their rewards. We've shown, if you get the ball in the right area, what can be done." "We bowled well this morning to take eight for a hundred and odd. It was a great effort by the bowlers. Then, for that to happen, I'm just lost for words really. "There were some decent deliveries and some poor shots, but it is a hard one to analyse. I'm still a little bit gobsmacked to be honest. "There's certainly a little bit in the pitch. It's dried out a bit and done a little bit more than. Put it in the right area and you get rewarded - the one Bergy got was unplayable. But the two at the end there, Lewis and Kyle, showed that if you get stuck in and show a bit of fight you can bat on it."